You are going to love Soaring Soren. I mean, I love finding books that my children love. And don’t get me wrong… There are a great many that fall into that category. 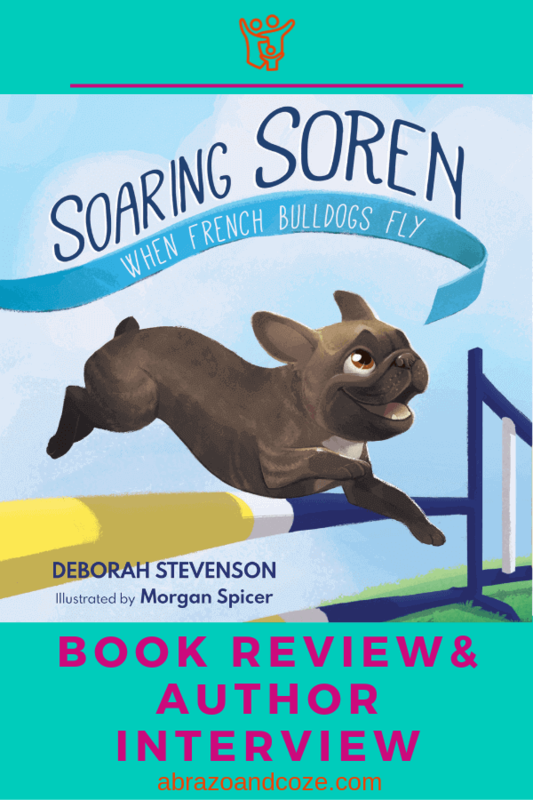 But Deborah Stevenson has knocked it out of the park with Soaring Soren: When French Bulldogs Fly. Together with illustrator Morgan Spicer they have created a picture book that every family should own. I’ve read this story many times already (I’ve owned the book for about two weeks). And I know I’m going to read it many more. Sometimes I just flip through the pages and smile at the pictures. I can’t help but find enjoyment from looking at the story rather than reading it because it’s so skillfully illustrated. But what makes this story so wonderful?? First of all, the text and images work together. The images don’t just illustrate the story, they give it life. Secondly, the story is written for children. Perhaps that goes without saying, but it is easy to listen to. The sentences are short. They are full of emotions. And children can relate to Soren’s challenges. Not because they have the same challenges, but because their challenges evoke similar feelings. Soren is a French Bulldog who was supposed to be a show dog. Instead, however, he becomes an agility dog with his owner, Deb. French Bulldogs aren’t supposed to be good at agility. They have big heads, short legs, and they’re kind of slow. Or so Soren is told. But that doesn’t deter Soren from doing his best. In fact, it fuels his determination to show the other dogs and trainers just how good he can be. Despite the odds against him, he becomes a master of the agility course. Similarly, children are often faced with circumstances where they want to become good at something but others tell them no. They’re told they aren’t good enough. Or that they don’t have what it takes. They can learn from Soren’s determination. And because this story is written from his child-like perspective, they’ll be more in tune with his feelings. Hello! My name is Deborah (Deb) Stevenson. I live in NJ and finance my other endeavors working as a Product Manager for a large telecom company. In my spare time, I love writing for children, training dogs, and teaching and competing in the sport of dog agility. I’m a mom (of a now-grown child) and an animal lover. Writing for children is something I began later in life, and it’s become a great passion. I love to share stories that make children laugh, that touch their hearts, that teach them to believe in themselves, to be kind, and to appreciate and respect animals. What sparked the idea for Soaring Soren? 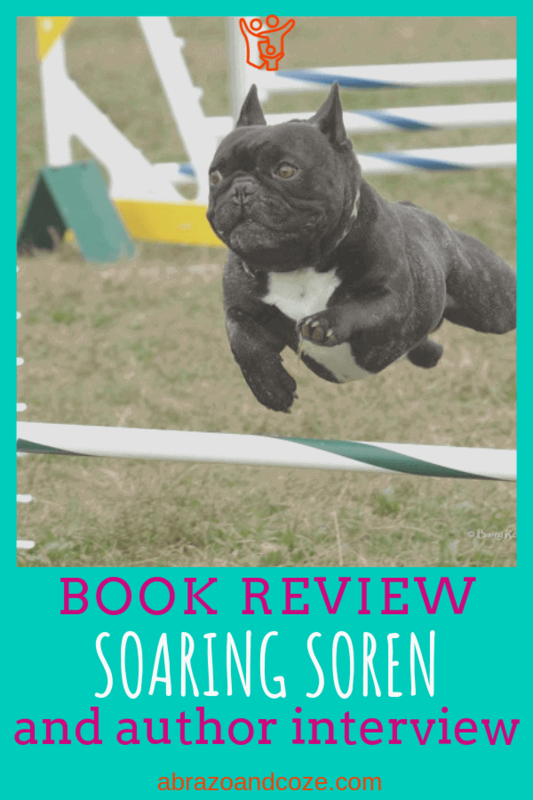 Soaring Soren is a true story, inspired by my French Bulldog, Soren. Soren came to the United States from Denmark to be a show dog, but he grew too big for that. The show ring’s loss turned out to be my gain. He was offered to me to be my agility dog. For those not familiar, agility is a very athletic sport where a dog and handler navigate an obstacle course. I was skeptical at first about a French Bulldog doing agility, but when I met Soren, two things happened. First, I fell madly in love with him. And second, I discovered he was a natural at agility, and he had a passion for it. Soren changed my life in many ways, but mostly because he showed me, and so many others, that we can’t judge a book by its cover. What we may lack in one area, we can compensate for with hard work, determination and just plain heart. When Soren passed away in 2016, I was determined to channel my “inner Soren” and make his book a reality. I thought he had both a wonderful story and some important lessons to share with children. Things don’t always turn out as we plan and that can be a good thing, leading us down a different path we were meant to follow. Most importantly, we should never let our limitations define us, because if we believe in ourselves and work hard, we can do just about anything. I always loved to write. As a hobby, I wrote some magazine articles and, for a few years, had a regular column in a magazine. Professionally I spent over a decade doing technical writing and instructional design. I also always loved to read, and when I had a child of my own, I wanted to share that love with him. Reading was a special time we shared each night before bed. Watching him fall in love with books was such a joy. It was then that I started thinking about being a children’s author because I saw what huge impact books could have on a young mind, and what a strong bond reading together forms between a parent and child. I’ve been told it’s hard for any author to trust an illustrator with their book. Just how scared were you to put your book in the hands of another artist? Morgan Spicer, who has illustrated all three of my children’s books, is phenomenal. Her artwork is incredible, but more importantly, she has such a great talent for storytelling through her artwork. The expressiveness of her characters, the perfect choices she makes for portraying various aspects of the story, her knack for using illustrations to capture the pace and emphasis of the story—they add so much. I always look forward to her input and I think her creativity and mine are very synergistic. I joke that she is my external imagination and when we work on a book, I cannot wait to see how she will visualize my words—it’s one of my favorite parts of the process. It did not come naturally at first, and I think that is one of the most interesting and challenging parts of writing picture books. Especially coming from a background of technical writing, I tend to want to be very detailed. It was a learning process to allow the illustrations to help tell the story, or in some cases, tell it entirely. I think the more I do this, the more natural it becomes—it is fun, and sometimes liberating, to let the art do some of the heavy lifting of telling the story. Usually, when I start writing, I just write everything down to get it all on paper. Once I’m done I go back through it with different “eyes,” and one important “eye” is for just this aspect. Can the illustration tell this part of the story? And because Morgan and I work together often, I will sometimes kick around ideas with her for how the words and illustrations can best work together on certain parts of the story. What were the challenges you had to encounter to complete Soaring Soren? First and foremost, since this was my first book, I had no idea how to get from the idea to a finished book. Publishing is very complex and there are so many options, not all of them reputable. So, you have to be careful, but also be willing to take some leaps of faith. Finding the right partner – a strong editor, a great illustrator, the right publishing options – are all so important. Because this book was a true story, I was very invested in many of the details, and I had to let some of that go in order to make it a story that was right for children. Have you ever had a dog before Soren that competed in agility trials or dog shows? What was that like? My first agility dog was Muzzy, a Doberman I adopted from a shelter. Muzzy had been abused and she was so frightened that I took her to obedience classes to try to help build her confidence. She was so serious and worried that someone suggested I try agility to get her to lighten up and have some fun. Muzzy did have fun, and I ended up falling in love with the sport, which is equally fun for dogs and humans. Muzzy had some fears that kept her from participating fully in agility, but agility helped her in so many ways. My next agility partner was my first Frenchie, Lulu, who enjoyed it, but physically could not do everything. What an amazing adventure and an amazing friend I would have missed out on had I not met Soren. Soren was PASSIONATE about agility, and about me, and being his teammate was an indescribable joy. In my wildest dreams, I would never have imagined the places he would take me and the things we would accomplish. Not only could he “do” agility, but at the height of his career, he was one of the top agility dogs in the country. Simply amazing for a little bulldog. And most of all, he was probably the best creature I’ve ever had the pleasure to call my friend. What was the most interesting place you travelled with Soren for the agility trials? We competed mostly in our general area (northeast), but twice we traveled to California for the AKC Agility Invitationals. It was an amazing trip. Soren was too big to fly under the seat, and he had separation anxiety, so he wouldn’t tolerate flying in cargo. The challenge was how to get there. Now-defunct Midwest Airlines had a celebrity pet program at the time, usually used for animal actors, where you purchase a ticket and the animal flies in a seat like a passenger. 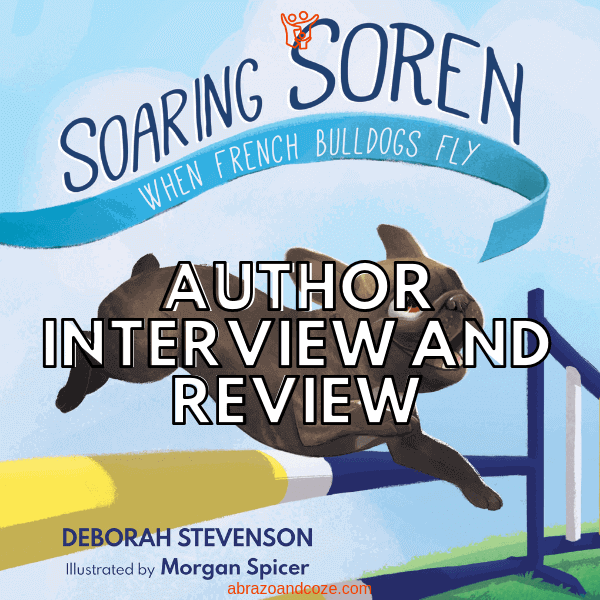 Through some connections of Soren’s co-owners, the airline agreed Soren’s status as the first agility champion Frenchie qualified him to fly as a “celebrity,” and they treated him like one too. The crew fell in love with him, and he was even invited to visit the cockpit and hang out with the pilot and stewardess during a stopover. Soren especially loved the inflight fresh baked cookies. Not to let any cats out of any bags or anything, but I actually have a manuscript completed for a story about our trip to California. Did Soren pave the way for other French Bulldogs, or other unlikely breeds to compete at agility trials, or does he hold that record of being the only one? He definitely did, and there are quite a few agility French Bulldogs these days, and even a number of agility champion Frenchies. One of them is Audra, Soren’s daughter, who still lives with me. 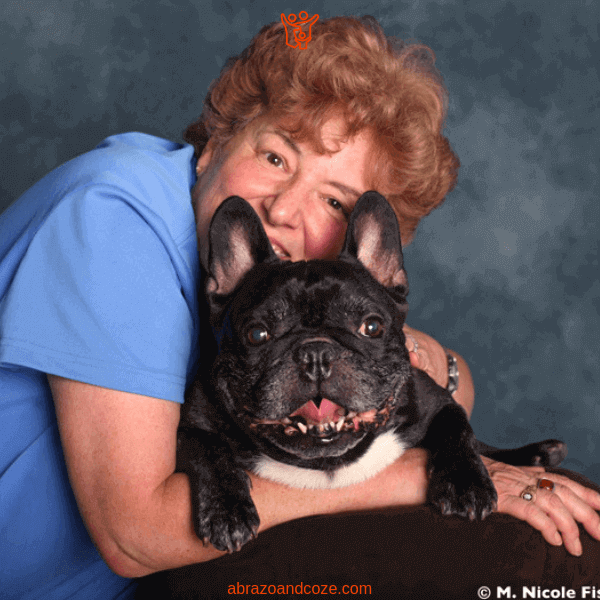 Although I no longer have a Frenchie agility partner at the moment (Audra is now 10 years old and retired), I did go to Agility Invitationals with my Rat Terrier last December, and saw a number of incredible and very athletic Frenchies running. And here at local competitions, there are some French Bulldogs who run agility, and their kind owners usually bring them over to visit so I can get my fix of Frenchie kisses, which are the best! Often competitors with Frenchies will tell me they were inspired to try it because of Soren – the dog or the book – and that is especially gratifying. I think the worst advice is probably from naysayers. There are a handful of people who will try to discourage a want-to-be author. No question it is a lot of work, and a lot of investment of time, energy and money. But if it’s something you truly want, then I think you can’t listen to those people. Like Soren, you have to channel your passion into determination, to move ahead one step at a time, with purpose and always heading in the right direction. The day I held the proof copy of Soaring Soren in my hand for the first time was one of the best days ever. Doing school visits and watching children fall in love with Soren, and really “get” the messages he taught is priceless. The best advice is probably a tie. My editor, Krista Hill of L Talbott Editorial, encouraged me and helped me believe that my stories were worth telling, and taught me how to tell them in the best possible way. My uncle, Richard Slotkin, a retired history professor and author, was also a huge help and steered me away from a vanity publisher contract that would have been a big financial mistake. And my illustrator, Morgan Spicer, has been a tremendous partner and inspiration as well. That’s tough to answer as there are so many incredible ones to choose from. E.B. White, Roald Dahl and Maurice Sendak are probably some of my favourites from my own childhood. From my son’s childhood, I loved Lemony Snicket and J.K. Rowling. You mean besides “tell me about Soren?” Haha. Watching the AKC National Agility Championships on livestream. Is there anything else you would like to share with us about yourself, your writing, or Soaring Soren? Maybe just how grateful I am for my friends, family, colleagues and readers, who encourage and inspire me. Not only did he take me on an amazing journey in agility, but he also ultimately led me down the path to writing for children, which has become a great passion. He has changed my life for the better in so many ways, and though he is gone now, he continues to drive me to push myself past my fears and limitations and to go after the things that are important to me. I hope, through his book, he continues to inspire others to pursue their own dreams as well. Thank you so much, Anna, for this opportunity to share my thoughts and my book with your readers! I hope you have the opportunity to read this story to your children and to add it to your home library. You can get a feel for the upbeat, positive nature of this book by watching this video that highlights the real Soren alongside his storybook counterpart. You can connect with the author on her website, or find her on Facebook, Twitter, and Instagram. The illustrator, Morgan Spicer also has a website. If you’re a teacher or homeschooling family you can find lesson resources here. And find a colouring page here. Finally, you can buy the book here or from the author directly. If you want to learn more about guiding your children to learn the skills seen in Soaring Soren, check out How To Raise Independent Children. For more books that teach lessons in fun, engaging language, check out these books. Cami Kangaroo Has Too Many Sweets, Let’s Celebrate Vaisakhi!, and High in the Sky are all good choices. Is determination or perseverance a skill your children have learned? I’d love to hear your stories of how your children used those skills, so please share them in the comments below.